I woke up early on day two of our Antarctic expedition to take in some scenic cruising from the top deck of the ship. The scenery was breath-taking as we passed along the narrow Errera Channel, between Ronge Island and the west coast of Graham Land. The view was dominated by huge tabular icebergs, high ice cliffs and steep glaciers. It’s fascinating to think that this area was only discovered relatively recently, in 1897 - 1899 by Belgian explorers. On closer inspection of the commanding and majestic icebergs I could make out small black dots, gatherings of penguins lined up in their black tail coats and white shirt fronts, standing to attention. We were headed for Neko Harbor, in the Andvord Bay. Neko Harbour is named after a whale factory ship which operated along the Antarctic Peninsula in the early 1900s. Today was going to be my first opportunity to land on the Antarctic continent. I felt extremely privileged and brimming with excitement to know I was going to be one of only 30,000 people to set foot in Antarctica this year. After breakfast we took a quick tour around Paradise Bay in the Zodiacs to explore. The weather was blustery and crisp but the air was dry. The icebergs and landscape were even more imposing up close. In the afternoon we were shuttled to the uninhabited shores of Neko Harbor the wind had dropped and whilst conditions were still polar the sun was out. As we approached small gangs of penguins could be seen diving and darting in the crystal clear shallows. An ungodly stench hung in the air, assaulting our nostrils. The stink was generated by the resident Gentoo penguin colony guano...also known as poop! Hundreds of penguins were nesting on low level rocky outcroppings or waddling about in the snow. The paradox of penguins is that they are so graceful and streamlined as they propel through the polar waters, but on land they totter across the snow as if they might be tipsy, often slipping and sliding on their bellies when the potholes in the icy terrain get too much of a challenge. We spent time squatting at the edge of the colony watching their behaviour. 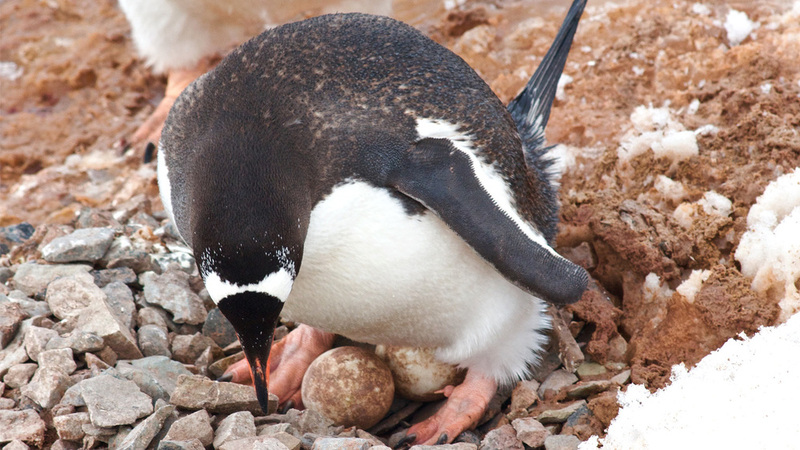 It was coming to the end of the breeding season, so the majority of penguins were still protecting eggs or recently hatched chicks. They are romantic little creatures, for once a penguin finds its mate they stay together forever. They also exhibit a great sense of gender equality as parents share the responsibilities of egg sitting and hunting and are highly nurturing parents. Although Gentoo penguin numbers are increasing on the Antarctic Peninsula they have plummeted elsewhere on the continent. Like all penguin species they are considered threatened and are protected by the Antarctic Treaty. I visited The Errera Channel, Andvord Bay & Neko Harbour on Thursday, 24rd December 2015 from MS The World.